Well we just finished the annual frontier day here at Fort Selden last Saturday, and between the firing of several artillery pieces’ including a Mountain Howitzer and a Gatling Gun (my personal favorites), and the living history demonstration of Fort Selden’s Friends group as well as various volunteers we were able to acknowledge the 150th year of Fort Selden’s existence since being established in 1865. We hope that those who attended and took part in the day’s activities enjoyed themselves as much as we the staff did and with that we say thank you for attending, and if you were one of the volunteers thank you for your time to make this a wonderful event. We will be posting video and photos from the day directly to our Facebook page, Fort Selden Historic Site make sure to check us out there to view those. The great World War II General Douglas MacArthur once called Fort Selden home, for a time during his early childhood. His father Arthur MacArthur was post commander during the 1880’s when the Fort was reopened. It was a busy month here at Fort Selden our Friends group hosted the annual Mother’s Day Tea which like always was a big hit and you can read more about and see some of the pictures from the event on our Facebook page Fort Selden Historic Site. We also got to meet with 80+ third graders from Alameda Elementary School that toured the museum and fort. The classes asked many awesome questions of the rangers here. 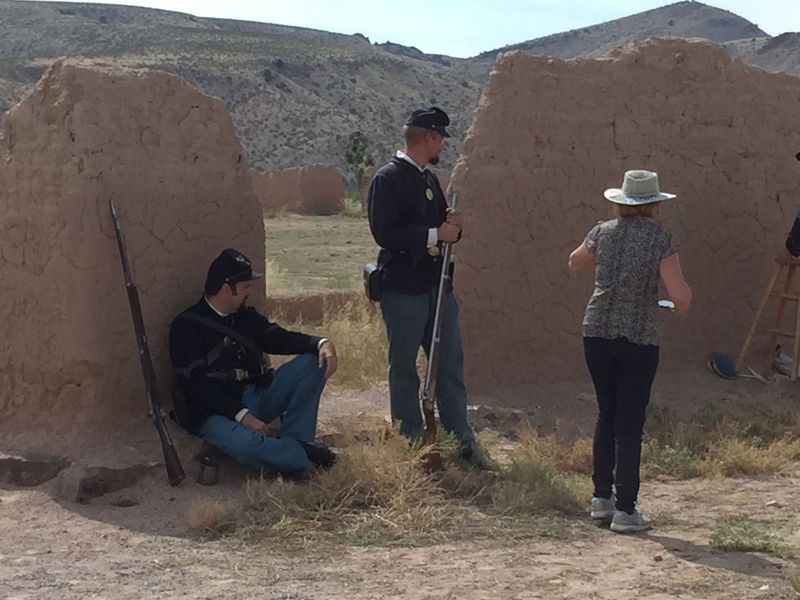 Their tour ended with an Indian Wars uniform and equipment demonstration from one of the staff. You may see more photos from there tour on the Facebook Page. On June 14th from ten AM tell one PM join us for live music performed by the Anslovers (Country, Bluegrass, Celtic, and Folk Fiddle) and a presentation on the Buffalo Soldiers’ by Chatauqua speaker, Fred Hampton. Don’t forget Father’s day breakfast on June 21st at nine AM come early as campfire biscuits & gravy go fast. If you’re looking for something fun to do on Mother’s Day and Father’s Day this year come visit us and our friends for the annual Mother’s Day Tea and Father’s Day Breakfast. Admission for all Mothers on Mother’s day and all Fathers on Father’s Day is free of charge. 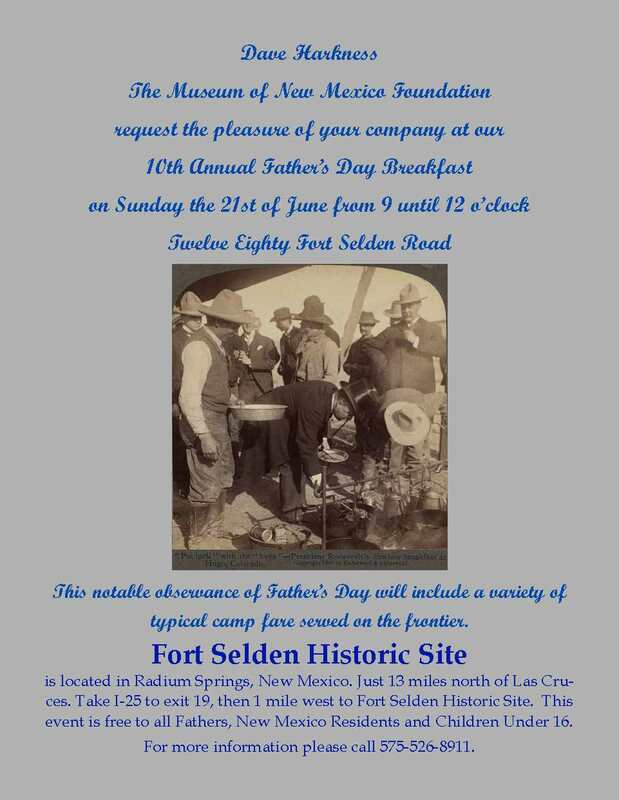 Hope to see you there if you have any questions feel free to call Fort Selden Historic Site at (575)526-8911. 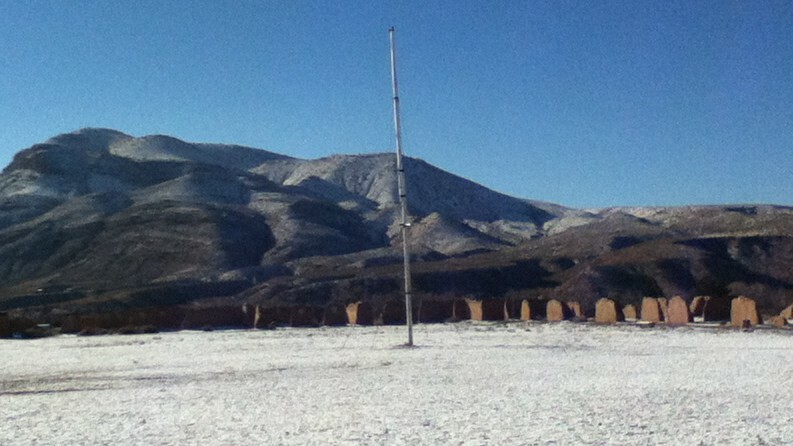 Left post with ten mounted men on 9 Jul ultimo chasing Indians who had stolen horses from Shedd’s ranch…. After following them for 4 ½ days… caught them west of Cañada Alamosa. I report the loss of Corporal Frank Brautling (Bratling). Three Indians killed. The stock recovered. Distance covered 350 miles. Corporal Bratling was the only one of the five to be killed in this battle and therefore the medal was awarded posthumously. It wasn’t until two years later on August 12, 1875 when these five were finally award their Medals’ of Honor. Over the next couple of months we will highlight each of these men by providing you a little more history and background of their lives. Aldo Leoplold High School visits Fort Selden!!!!!!!!!!!!!!!! Today Aldo Leopold High School from Silver City, NM made their yearly trip to visit us here at Fort Selden. 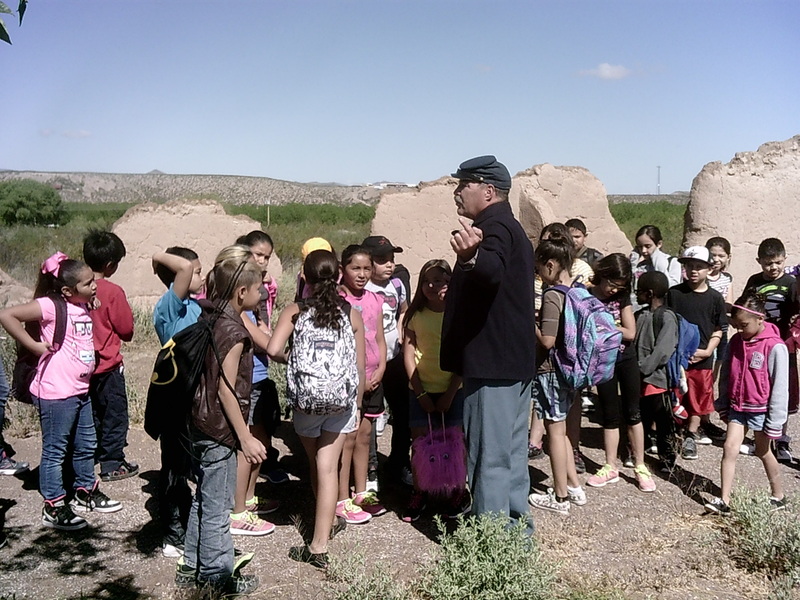 The students seemed to enjoy their visit and learn a little bit about how life was here at the fort. A big thanks to John Smith of the Friends of Fort Selden group for giving up a piece of his Sunday morning to give a blue suit demonstration to the students. The following excerpt is found on pages 14 and 15 of General Douglas MacArthur’s memoirs: ‘Reminiscences’ McGraw- Hill Book Company, 1964. The passage is reflective of a young lad moving to and living in an exciting and exotic land that most boys only dream of. “We numbered but four in our little family when orders came in 1884 for “K” Company to march overland 300 miles from Fort Wingate to tiny Fort Selden, some 60 miles above El Paso, to guard the fords of the Rio Grande River from the ever-present danger of Geronimo’s marauding Indians. My first memories are of that march. The little outpost at Fort Selden became our home for the next three years. Company “K,” with its two officers, its assistant surgeon, and forty-six enlisted men comprised the lonely garrison, sheltered in single-story, flat-roofed adobe buildings. It was here I learned to ride and shoot even before I could read or write-indeed, almost before I could walk and talk. My mother, with some help from my father, began the education of her two boys. Our teaching included not only the simple rudiments, but above all else, a sense of obligation. We were to do what was right no matter what the personal sacrifice might be. Our country was always to come first. Two things we must never do: never lie, never tattle. As you travel north up the El Camino Real from Mexico you come to a part of the trail that is Known as the Jornada del Muerto which means Journey of Death. For nearly a hundred miles the El Camino Real leaves the banks and safety of the Rio Grande making water hard to come by and exposing travelers on the dry open landscape to various bands of outlaws, apaches, and other renegades looking for an easy target. Fort Selden marks the location were this section of trail began for those traveling north and were the long dry trail came back to the banks of the Rio Grande for those headed south. When the United States opened Fort Selden at this location the soldiers stationed here found themselves escorting various parties along this treacherous stretch of road on a regular basis.